A very common species near the seashore in brackish pools, lagoons and saltmarshes; also in estuarine marshes such as those of the Lower Bann. 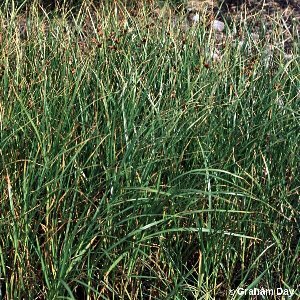 The plant requires high levels of sodium salts in order to grow: in central Europe this requirement can be met in soda lakes and marshes far away from the sea, but in Ireland it is strictly maritime. All names: Bolboschoenus maritimus (L.) Palla; Scirpus maritimus L.